Why it’s so important to study an Accredited Beauty Course! Why is it so important to study an Accredited Beauty Course? Booking onto a beauty course is meant to help you turn your passion into a new career. But potentially booking the wrong course or with the wrong provider could be a costly mistake. Our priority is to ensure all students are booked onto the right course to meet their needs from the very start. That’s why we only work with knowledgeable beauty professionals within our Course Advisor team. There are so many beauty courses out there to choose from, how are you meant to decide which one is right for you? Enrolling onto a beauty course is meant to equip you with the knowledge, skills and confidence to get out there and start earning providing beauty treatments. Not only does booking a course cost you money, but your time is precious also and you need to be sure you invest in the right course for you right from the start. You also need to ensure that the training provider you select will give you the support you require to complete your course should you run into difficulties and you need to check that the provider is also accredited. A training provider needs to be accredited to ensure that once you have taken the time and money to complete your course, your certificate will be recognised within the industry and most importantly that it will enable you to gain insurance to begin earning. There are a number of bodies that a training provider can be accredited with – we are accredited with the best! 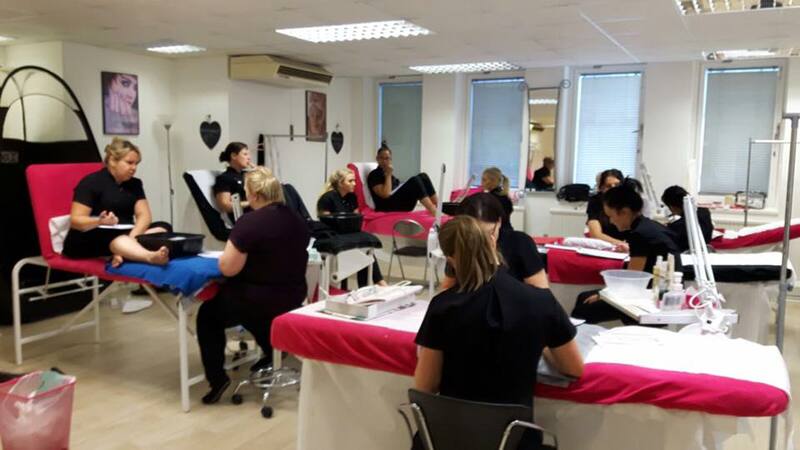 All courses at The Beauty Academy are accredited by ABT who are the industry leading provider of beauty therapist insurance and membership services. We also offer a number of diploma options which are accredited with BABTAC who undertake rigorous checks of all their approved training providers to ensure you are studying a course of the highest standard. We also offer a wide range of Level 2 & 3 qualifications through the awarding bodies VTCT and City & Guilds who both offer internationally & UK recognised professional qualifications which are favoured by employers and by studying on a fast-track basis you can be sure you’re on the right path to employment with a salon, spa, cruise liner or even opening your own beauty premises! In order to maintain our accredited status, we must demonstrate that our courses provide the highest quality training to our students and that our training facilities are equipped to the best possible industry standards and all courses are lead only by qualified and experienced professional beauty tutors. All of our tutors hold teaching qualifications and levels 2 &/or 3 within the beauty treatments they are teaching you to provide. We also offer an in-house Support team manned by friendly and beauty qualified support staff who are available at no additional cost, by telephone or email through your studies and beyond. You can be sure by enrolling upon any of the many courses provided by The Beauty Academy that you are truly receiving the best value for money and that your training course will enable you to achieve your career goals. We have 9 permanent and exclusive training centres across the UK. We don’t train from hotel rooms or conference suites. We don’t expect you to purchase any expensive kits in order to attend our training days, we provide all products & tools you will require at the centre on your training days so you can just focus on learning new skills. All courses include a comprehensive training manual at no extra cost, which means you can spend more of your time on training days practising your treatment skills and not writing hours of notes. Our Course Advisors are available to call on Freephone 0800 999 2277 or on Live Chat on our website giving you course advice to ensure the course you book is the best course to meet your own individual career aspirations and needs. Our entire head office team are all fully qualified beauty professionals who have been there, gone through the training themselves and so really understand how best to guide and support you. We also have a Facebook & Twitter page allowing you to stay up to date with the latest news, offers, industry developments, job opportunities across the country, get in touch with other students & even promote your own beauty business.